TPNet is an external TPU lattice structure which is injected into the outer fabric. TPNet is used to add support and protection to the upper whilst adding minimal weight and it allows for maximum breathability. TPNet is a lattice of thermoplastic polyurethane which is injected into the outer fabric. This TPU lattice creates an exoskeleton like structure which stiffness the fabric. TPNet may be used to provide ample lateral ankle support around the heel area of a lightweight boot with minimal weight. TPNet is very durable also serves to protect the underlying fabric from abrasion. Since TPNet is injected into the fabric rather than glued the bond is permanent and will not delaminate. The large holes in the TPNet lattice allow for much better breathability than traditional non-permeable reinforcement layers. UPPERS: Upper constructed from an innovative combination of high-tech outer material, lining and membrane. Ultra light weight with class leading waterproofness and breathability. TPU overlay for added lateral support. Rubber toecap for protection. LINING: Extra-hydrophobic lining with H2O-finishing and high-performance Sympatex® membrane. Fast and effective transport of sweat away from the foot. MIDSOLE: Boreal PB-60 with EVA top sirafec layer for added underfoot comfort. SOLE: Vibram Borealis rubber outsole with shock absorbing EVA. TPU piece under the toes and under the heel for support and stability. The upper is made from a unique high-tech three layer laminate material with a Sympatex® waterproof breathable membrane and a hydrophobic mesh lining. An injected TPU lattice provides great support and protection to the upper with minimum weight and an injected rubber toe cap adds useful protection. The very low number of seams and soft nylon tape lace loops gives Hurricane an outstanding sock like fit, and the breathability of the upper to moisture vapour far exceeds the performance of traditional waterproof designs. Hurricane is fully board lasted with a full length midsole, just like our other hiking boots and so offers the same high level of underfoot support on rough ground. The midsole has a soft polyamide monofilament top-layer surface which not only adds extra underfoot cushioning but also improves the transport of moisture away from the underside of the foot. The lightweight Vibram® Borealis sole unit combines superb shock absorption with an aggressive tread pattern for great traction on both hard and soft surfaces and features an integrated injection molded piece in TPU which improves torsional stability. 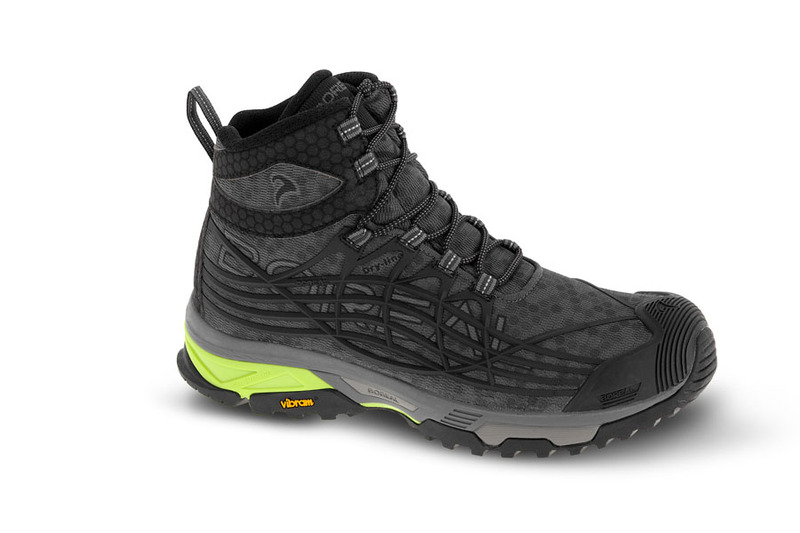 Our all new improved version of the Futura is a waterproof multi-purpose trail walking shoe with unprecedented levels of comfort and breathability. This high performance is made possible with the revolutionary construction techniques and unique advanced materials used. With Futura you’ll experience all the benefits of a waterproof lining without the shortcomings.